les mains noires: Y13W18 .DJ TUDO E SUA GENTE DE TODO LUGAR - NA AVENIDA DO FORTE + FORRÓ DE REBECA - DESPEDIDA (DJ TUDO REMIX). Y13W18 .DJ TUDO E SUA GENTE DE TODO LUGAR - NA AVENIDA DO FORTE + FORRÓ DE REBECA - DESPEDIDA (DJ TUDO REMIX). Alfredo Bello aka Dj Tudo is someone I already posted about. Pillar of the new musical scene in Brazil, the musician, producer, dj, ethnomusicologist and tenacious researcher is just back from a month spent in Europe with his luggage packed with 2 new releases! Perfect to wait until his new Lp expected around January 2014! Be sure that I'll be here to let know about this as soon as It will be available. And so, It is not one but two tracks that I'm posting! Check them! .DJ TUDO E SUA GENTE DE TODO LUGAR - NA AVENIDA DO FORTE Ao Vivo. .FORRÓ DE REBECA - DESPEDIDA Dj Tudo Remix. The first track is extracted from the Live double Lp. Recorded on July 29, 2011 at the Auditorio Ibirapuera, Sao Paulo, Brazil, this show has been a huge celebration to music! 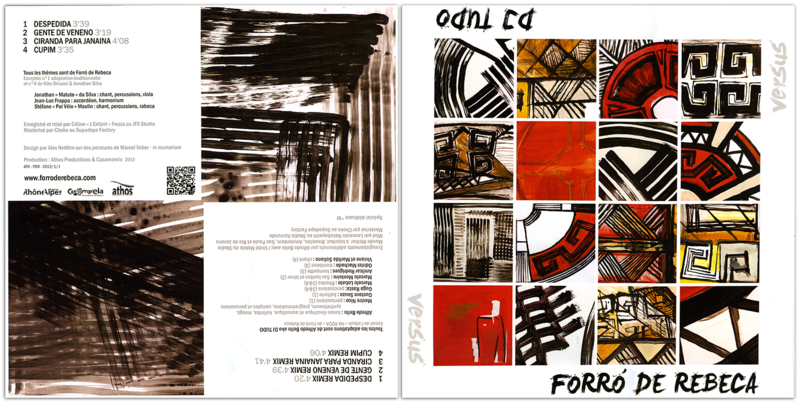 25 musicians all together on stage playing Dj Tudo compositions from his 2 LP (Garrafada and Nos Quintais do Mundo) and extra compositions as the one I chose to post, 'Na Avenida Do Forte'. The second has quite a special taste to me as it envolves my hometown. Indeed, in 2008, in Lyon, has been founded a band called 'Forro De Rebeca'. As its name indicate, the band is playing traditionnal Brazilian North Eastern rhythms. The formation gradually forge a solid reputation, asserting them self as a reference in the style. In contact with Alfredo since years, they invited him to make remix of their last record. The result is super nice EP that could actually be called a 'Versus EP'. Indeed, you'll find one the A side 4 tracks by the band and on the B side, the same tracks, remixed by our dear Dj Tudo; once more a great mixture of tradition seen through modernity! Thanks for the info on this. Easier said than done to say "Get your copy!" At least in the US. 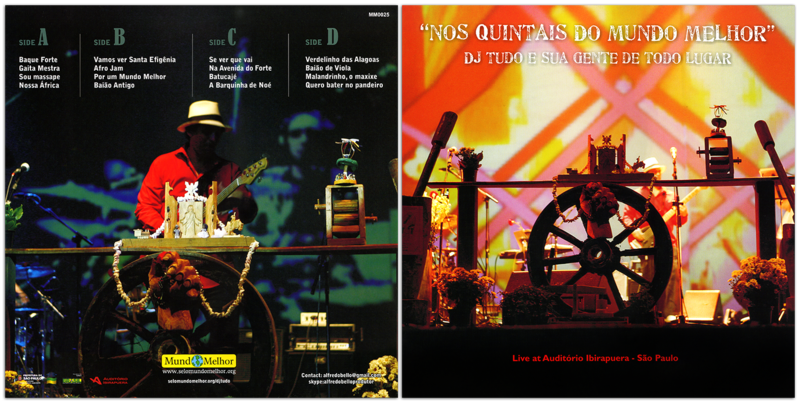 I spent sometime trying to get "Nos Quintais do Mundo" because of its beautiful design (as seen on this very blog). I got a download, but it's just not the same. But, I guess, I have until August to figure out how to get his new one now! Many thanks for your comments! I'm glad that you like Alfred's work! Yes, I know that It is not so easy to find his record but you can find them through his website 'SeloMundoMelhor.com'. 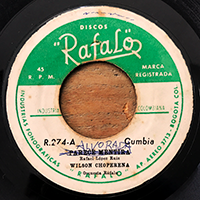 I also have a record shop online and there is there Alfredo's record (http://www.gomagringa.com/artist/mundo-melhor). There is not his last one by now but I'm in direct contact with hil as he's a friend so if you want some copies, just let me know and I'll manage everything with him! Thanks, Fred, we should work something out. I got a lot on right now so it may be a few weeks, but I'll keep it all in my head. You're welcome Jonathan! Feel free to ask me whenever you want or need! But at least I can listen to Forró De Rebeca on Soundcloud! Once I've finished listening to "Kenya Special". I am really enjoying this! Second time through 'n'all! PS Are you fred or faud or both?! Sincerely glad you're enjoyeing it! They'll be happy to know this!